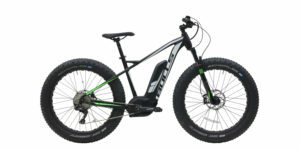 Integrated, Sealed Cartridge, Tapered 1-1/8" to 1-1/2"
Surface 604 has been selling unique fat tire e-bikes since 2014, two urban models called the Rook and Colt since 2016, and I fell like they combined best of both worlds for the new the Shred model. 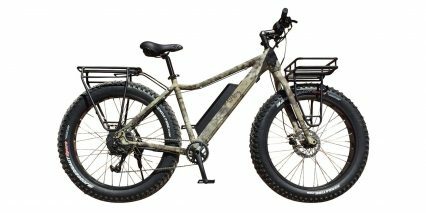 It’s hardtail electric mountain bike with larger plus sized tires, that comes with a kickstand, trigger throttle, integrated headlight, and rear rack bosses… It’s a platform you can enjoy around the city, even commuting to school or work, but comfortably detour across dirt paths and even take mountain bike on the weekends. 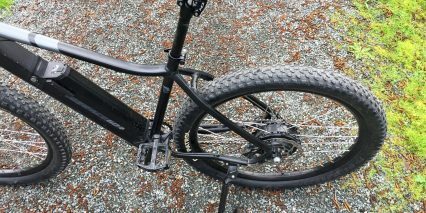 Yes, it’s a hardtail, so the geometry and intended use is more cross country than trail or all mountain, but the 120 mm suspension and higher volume tires do provide good comfort and control. They also sell a Suntour NCX suspension seat post upgrade for $99 if you want to simulate a full suspension feel (that’s a definite yes for me). 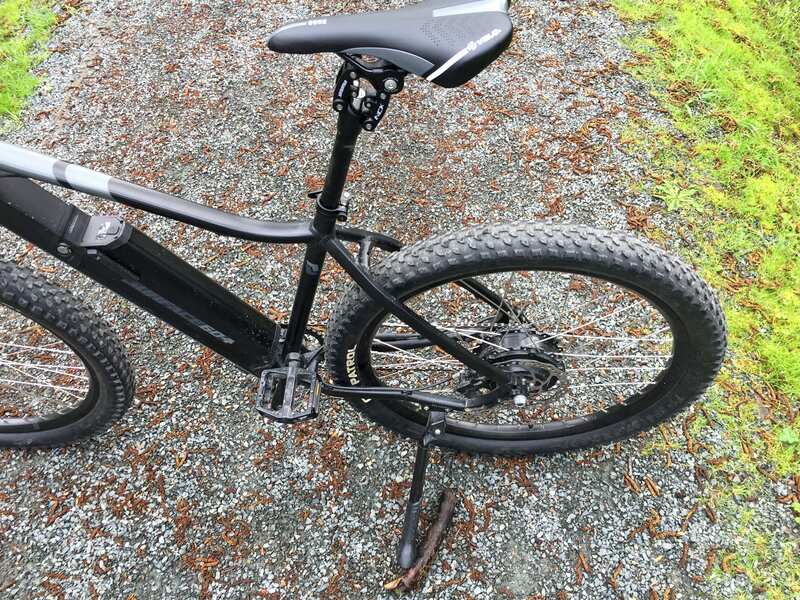 Frankly, there’s a lot to say about this electric bike because it blurs the lines on price and features. You can definitely find cheaper hardtail products out there right now, but they may not offer a sturdy adjustable angle headset, a SRAM X5 drivetrain, 180 mm hydraulic disc brakes with motor inhibitors, or a torque sensing bottom bracket. 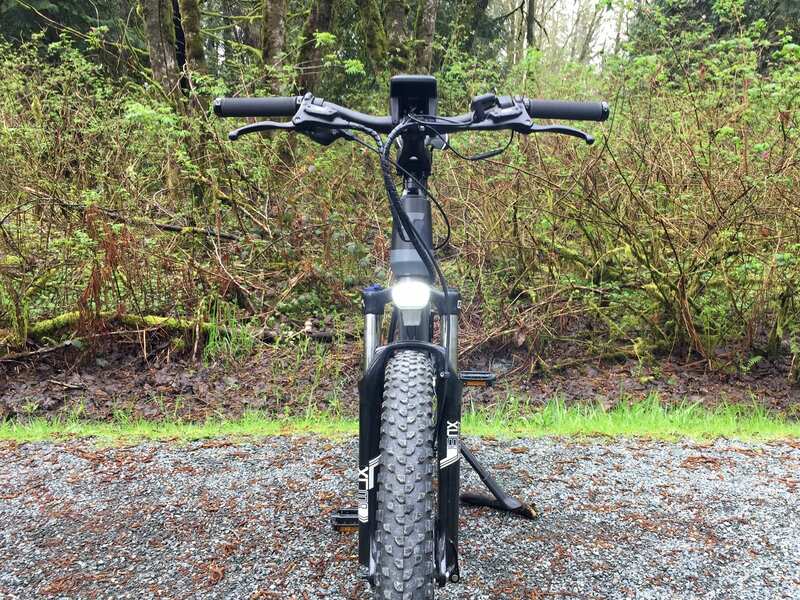 The product designer for this bike, Sam Atakhanov, met with me and the owner of Cit-E-Cycles in Langley British Columbia, Canada to film the video review. He had been riding the bike daily and racked up 282 miles (453.8 km) on the pre-production unit I got to test ride. I made sure to confirm the differences between it and the final models, which included the addition of a bottle cage mount on the base of the downtube and rear rack bosses on the seat stays. Sam used to be a semi-professional mountain biker and his appreciation for the little details becomes evident very quickly. The frame has been thoroughly stress tested, comes with slightly wider rims and thicker spokes, uses a tapered head tube that will accept nicer air forks if you decide to upgrade someday, and is available in two frame sizes for optimal fit. 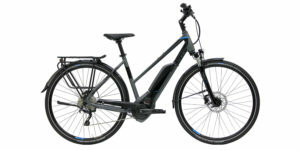 In my opinion, it looks great and performed very well during the ride tests… and unlike most competing products, it offers Class 3 speed pedelec performace up to 28 mph (45 km/h) and comes with a removable trigger throttle. 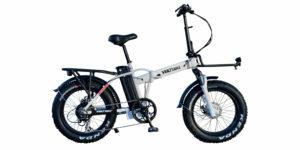 You can dial down the speed and remove the throttle for Class 1 trail use, or keep them engaged for fast urban commuting and easier starts from traffic signals. Awesome! 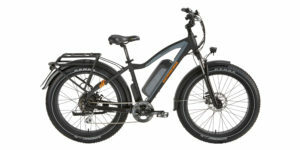 Driving this bike is a planetary geared hub motor from Bafang rated 500 to 750 watts. I’ve seen comparable products from Bafang, but was told that this one offers 50 Newton meters of torque vs. 40-ish on some older versions. It’s compact, painted black to blend in with the black frame, and surprisingly quite. While reviewing the on-frame footage for the video review above, I was simply blown away by how much quieter this motor is than most of the other geared motors I’ve seen in recent years. Perhaps it’s the motor or the nicer controller that Surface 604 is using. I should have ridden it on pavement to reduce the gravel noise and really isolate electronic whirring, but even still, the camera was mounted very close to the hub motor and didn’t pick up much sound. 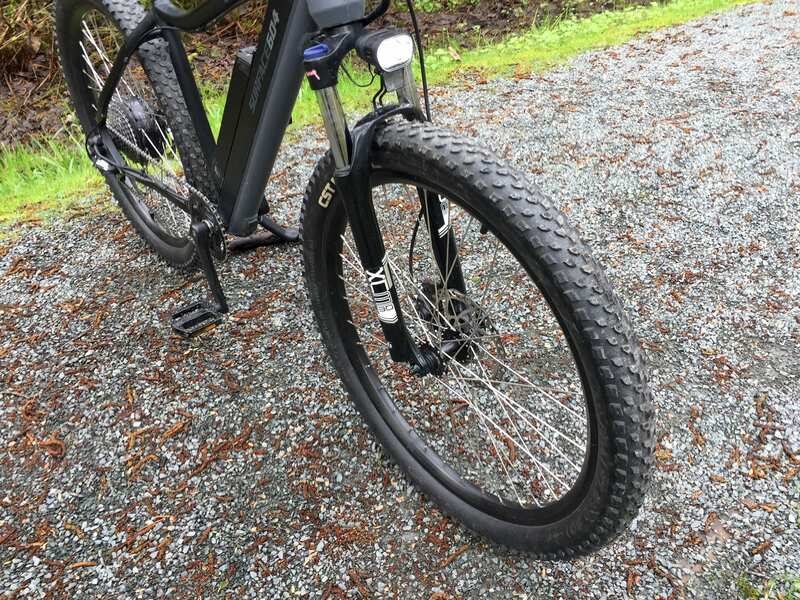 I do wish that Surface 604 would have specced black spokes instead of silver, but they match the cassette sprockets, chain, and stanchions on the suspension fork alright. 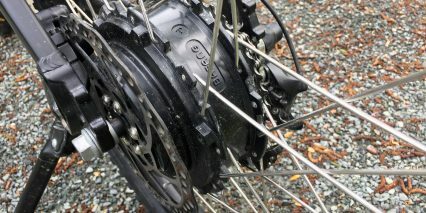 The motor is almost completely hidden from the side, sandwiched between a 9-speed cassette and 180 mm disc brake rotor. It won’t interfere with pedaling the way a mid-drive would, but it isn’t as efficient either – because it cannot leverage your gears. On the right hand side, there’s a power cable protruding from the axle that leads up to a disconnect point for wheel maintenance. This cable is a point of vulnerability that I see frequently, and it should be fine if you avoid snags and don’t lay your bike down to the right. 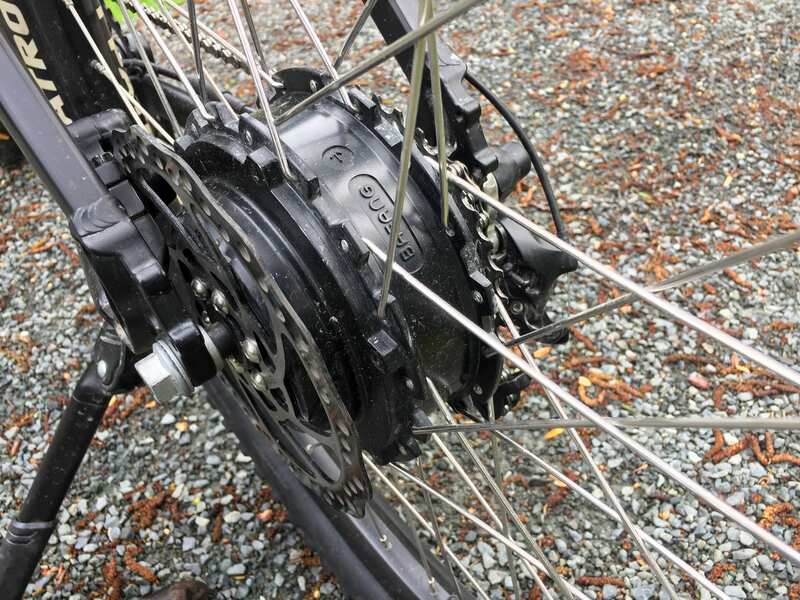 You could install an aftermarket derailleur guard like this for added protection, and I wish the Shred had at least a basic slap guard sticker on the right chain stay to keep the black paint looking nice. 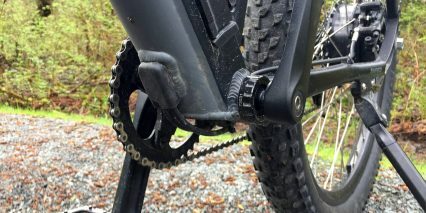 The driveline was scrutinized by Sam and shifting felt easy, but there is no chain guide and the chainring does not offer narrow-wide teeth so I’m guessing that chain drops could still happen. 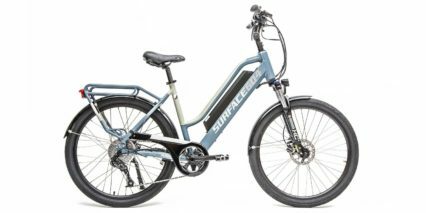 With a 38-tooth chainring up front and 11-36 tooth cassette, this ebike is overkill for urban riding, comfortable at high speed, and good enough for moderate climbs, but lacks the super low gear for really steep ascents (something like 11-42 tooth would be ideal there). I love the Wellgo platform pedals that were chosen, because they feel sturdy, offer great traction, and match the black paint job. 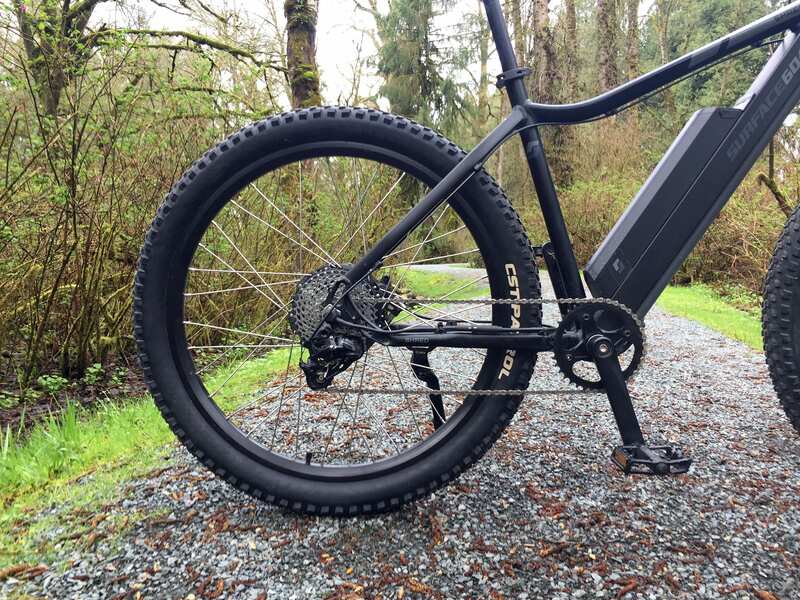 Powering the Shred is one of two downtube-mounted Lithium-ion battery options. Both offer 48 volts but the stock pack is rated at 10.2 amp hours with the upgrade providing higher capacity at 14 amp hours (for $200 more). 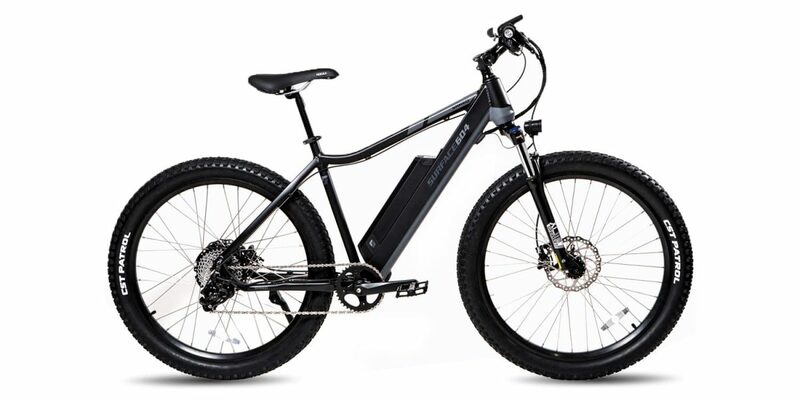 I have seen this battery pack design on other value-priced electric bikes including Surface 604’s own Rook and Colt. 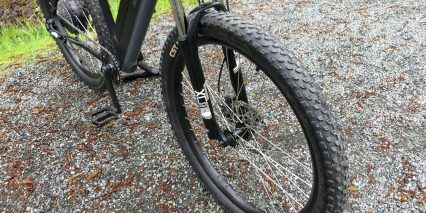 It’s semi-integrated into the downtube, which looks great and keeps weight low on the frame. I love how it mounts from the left side at an angle vs. straight up and down, because this allows for a lower top tube which decreases stand over height. To be honest, the stand-over on the Shred isn’t super low, but this was a conscious design decision that Sam made to provide strength and ride stiffness. It sounds like both battery packs weigh about 7.1 lbs because the number of cells inside is the same… with the higher capacity option, you’re getting fancier cells that pack more energy into the same space. 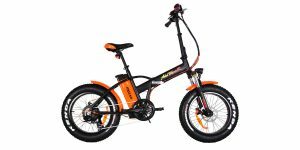 The battery can be charged on or off the frame, and is easy enough to remove. 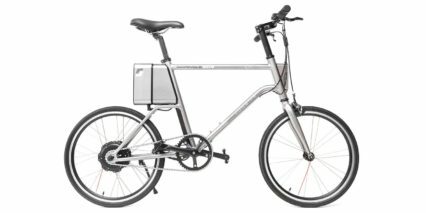 There’s a locking cylinder on the right side of the downtube, towards the top, and a spring-loaded lever that doubles as a handle to carry the pack safely. 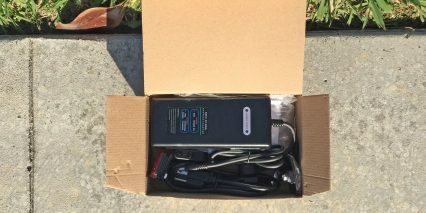 The charger that comes with the bike is fairly generic, offering a standard 2-amp output. Expect 5.5 to 7.5 hours for a full charge, depending on which battery you get. I like how compact and lightweight this charger is, but it seems like the charging port is positioned in a vulnerable spot, very near the left crank arm, when the battery is mounted on the bike. Be careful when charging… at least the bike will be stable if you leave the kickstand on. 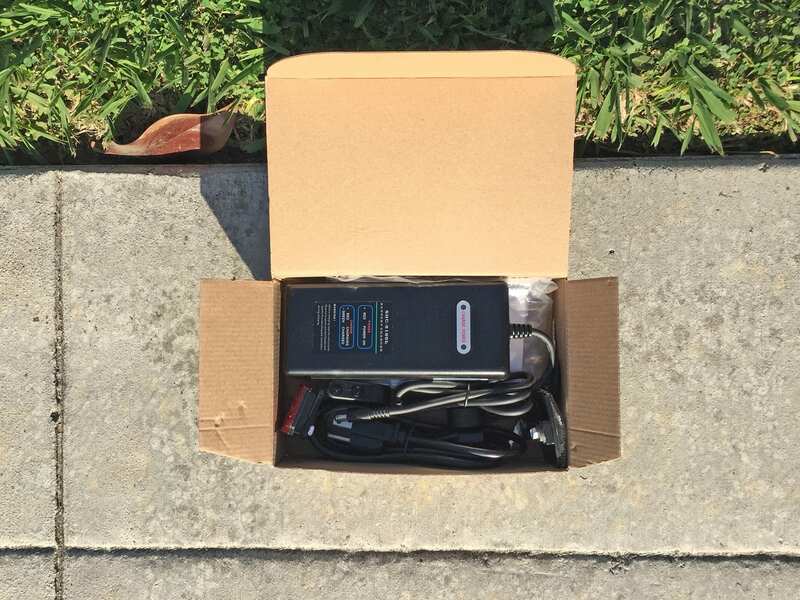 I have learned that extreme heat and cold can degrade Lithium-ion cells and reduce the lifespan of the pack, so take it off if you leave your bike in a shed or garage during the winter or summer. 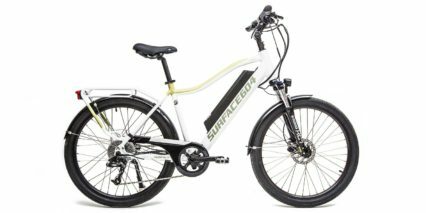 It’s best to keep the battery charged above 20% to reduce stress on the cells, but Surface 604 does offer a comprehensive one-year warranty and replacement packs if you notice the capacity waning after a couple of years or want to double your range for longer bikepacking and camping adventures. One final delighter with this battery pack is a full-sized USB port integrated into the right side. 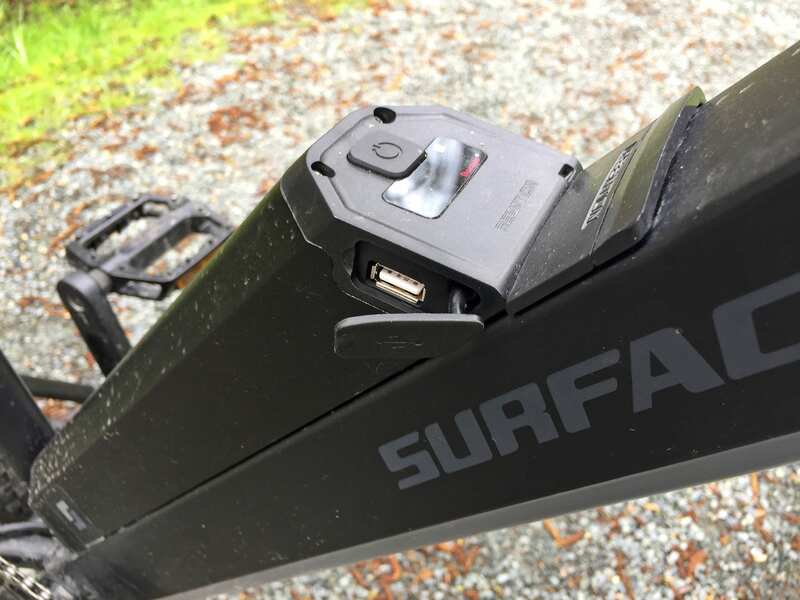 You can plug additional lights, GPS units, tablets, or your smartphone into this port and use it on the go… just be careful with how you manage additional wires. Most of the stock shifter cables and electrical wires on this e-bike have been internally routed to reduce snags and keep it looking great. 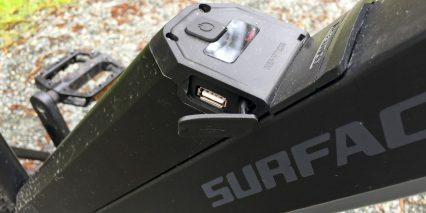 It would be nice if the USB port was mounted up near the display vs. on the battery pack itself, to reduce wire clutter, but you could always use a right-angle USB adapter and some zip ties to minimize snags and make it work as-is… and again, this way the port can be used even if the battery is not mounted to the bike. Operating the Surface 604 Shred is fairly straightforward and very intuitive because of the five-button control pad. 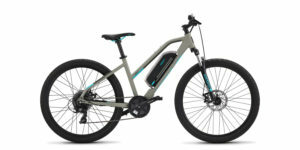 Some cheaper ebikes require two-step activation where you have to press the battery power button and then a second button near the display. With the Shred, you simply charge and mount the battery, then press the power button on the control pad – which is within reach of the left grip. I like tis, especially given the addition of a trigger throttle, because it puts you in a stable and controlled body position before the bike becomes active. The display boots up quickly, feels very sturdy, can be swiveled forward and back to reduce glare and reflection, and has a bunch of great readouts. It’s fairly large, backlit for use at dawn or dusk, and features a 10-bar battery infographic vs. just 5-bars on many other displays. This could be the difference between making it home with power to spare or guessing wrong and having to pedal a 57.3 lb beast for several miles unassisted. 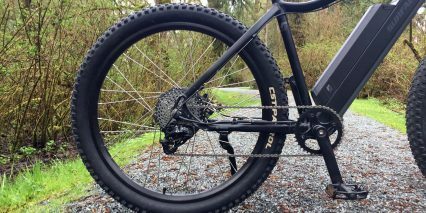 Yes, this bike is definitely on the heavier side for a hardtail, but that comes back to the sturdy frame build, larger motor, and plus sized 2.8″ tires. And remember, with mountain bike gearing, the bike is easier to pedal up hills or unassisted, and the motor freewheels efficiently so there’s no drag, just a bit of extra weight. Once on, the display shows your current speed, some trip stats, and five levels of assist. You can navigate through these levels by pressing the plus and minus buttons on the same control pad. It’s all fairly intuitive, but you may have to glance down to know which buttons you are pressing because there are five vs. just two or three on a setup like Bosch or Shimano. The addition of a light button is put to use here with that great Spanninga Axendo 80-Lux headlight. It’s super bright and aimable, so you can actually use it to see vs. mainly keeping yourself visible with cheaper options. My only complaint is that it’s mounted to the arch of the suspension vs. the head tube or handlebar (which wouldn’t bounce as much). 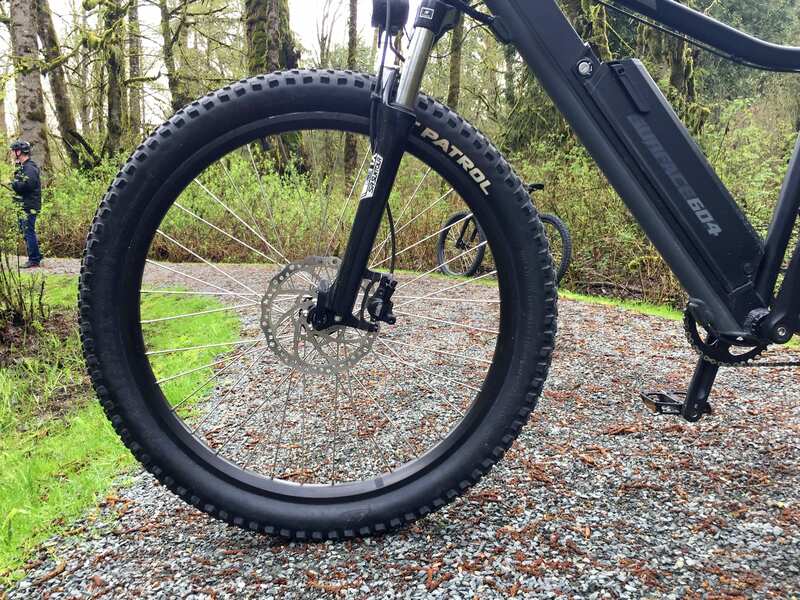 At the end of the day, if you’re mostly riding off-road, the kickstand and light could be removed for weight savings and reduced chatter on bumpy sections. In closing, the display unit and button pad work very well together, but are not removable. This could introduce scratches, sun, and rain wear over time… but is not uncommon. Perhaps my biggest gripe here revolves around software. The trigger throttle is limited in power and speed by whichever assist level you have chosen. If the bike is running in assist 1 or 2 to save battery power, the throttle won’t be as powerful or go as fast… so you literally have to click the + button three times to get to level 5, and even then, the throttle is offering less than what you could get with pedal assist. I asked Sam about this and learned that it has to do with a limitation Bafang has placed on the system. Boo! This is a variable-speed trigger throttle, please let ME choose how much speed and power to use Bafang, this sort of thing happens on many value priced ebikes because they are the result of multiple vendors working together. It’s part of what keeps the bike under $2k, but it is a limitation that requires more effort and distraction to overcome if you use the throttle frequently. Thankfully, the torque and cadence sensing bottom bracket on this bike is AMAZING. Seriously, it’s my favorite current generation sensor like this. 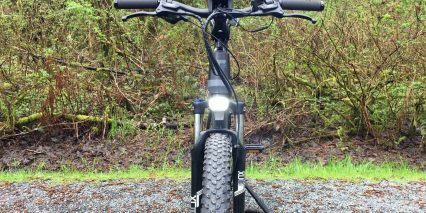 Pedaling feels smooth and natural, the motor kicks very quickly but without the jerky on/off feel of a cadence sensor only. 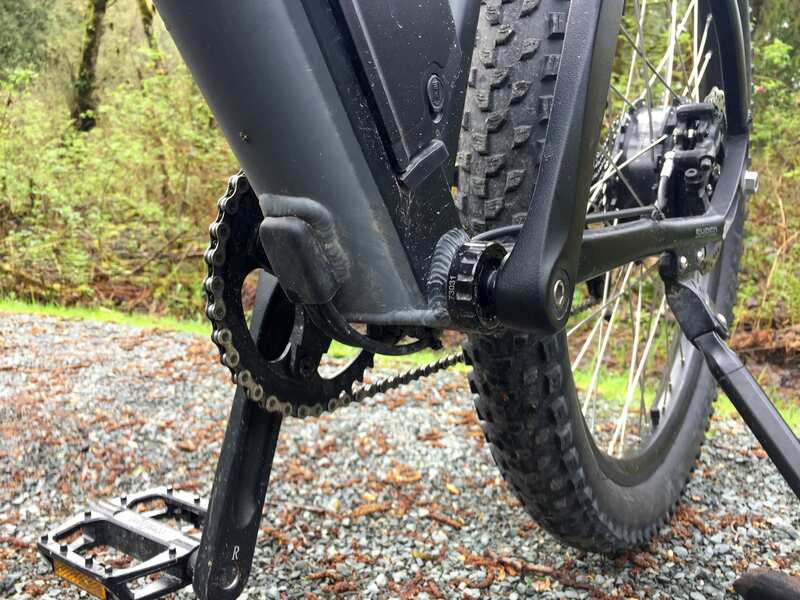 I didn’t notice any surges with chain bounce and feel that the compact sealed design of the sensor (on the left side of the bottom bracket) will be very durable in off-road muddy environments. Perhaps I’ve been a little hard on the Shred, introducing technical topics and really scrutinizing design choices… but that’s because it can actually hang with some of the bigger guys. For under $2k, it feels like a great value and offers a combination of performance and aesthetic that separates it from the pack right now. Again, two frame sizes! That ain’t free ;) There are a few more little considerations to discuss here before finishing: the handlebar is narrower than a true cross country or trail bike, and this makes it easier to walk through doors and ride between cars in traffic, the kickstand is positioned far enough back that it won’t collide with the left crank arm when walking the bike backwards or performing drivetrain cleaning and maintenance, the wheels use standard 9 mm and 11 mm axles vs. thicker thru-axles (15 mm and 12 mm) and the hub spacing is traditional vs. boost which would offer a sturdier bracing angle for the big tires. 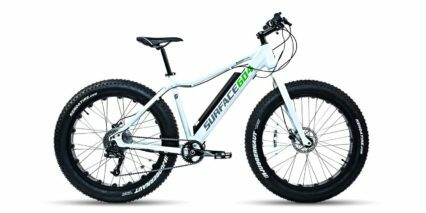 Surface 604 went with 27.5″ x 2.8″ plus tires vs. the widest 3.0″ tires, which may not require boost and probably cuts down on weight, making the bike feel nimble for cross country and urban riding. Again, it’s a real hybrid of urban and trail design here, but they didn’t go too cheap. 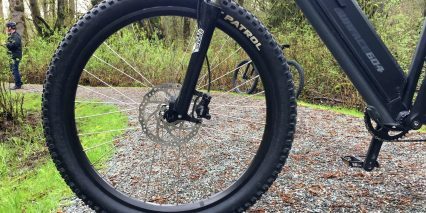 The spring fork isn’t as adjustable or lightweight as air, but it still offers compression adjust with lockout and preload. The front wheel offers quick release that makes transporting on some car racks easier. This is the first generation of the Shred, but I could tell that Sam has been scrutinizing the product and building off of a rich history of off-road products. 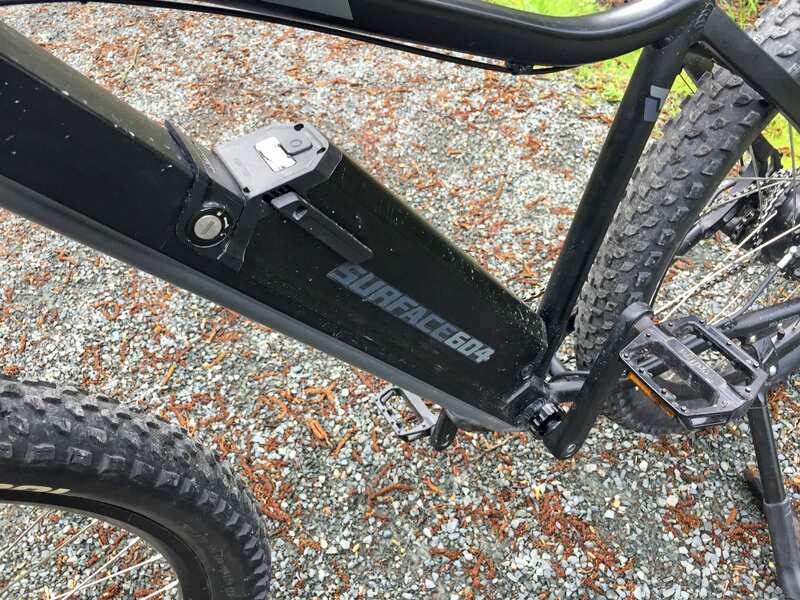 The Surface 604 fat bikes have held up well and I was told that they will be offering a very similar rear rack to work with the Shred so you don’t have to guess and adapt one yourself. If you want to experiment with the display settings, double tap the i button on the control pad, this is where you can change units or adjust the top speed. I like how the systems are fairly open here and want to close by praising the quick-disconnect throttle for those who want to obey specific laws or who live in states where Class 2 or 3 may not be as widely accepted. 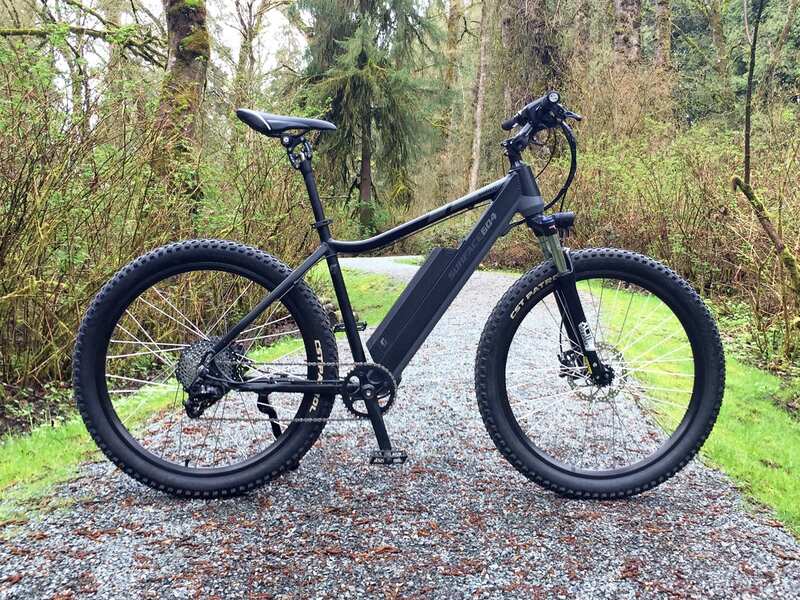 This is an ebike that feels natural, offers a lot of power and speed, but balances it out responsibly with good hydraulic disc brakes, motor inhibitors, and a custom frame that was optimized for the trail. 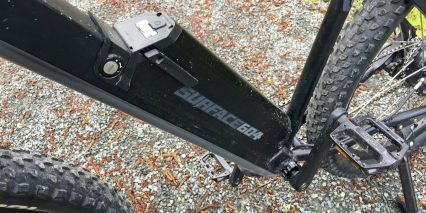 Big thanks to Surface 604 for partnering with me on this review, letting me compare their bike to some of the higher-end Bosch powered Cube models, and coordinating with Cit-E-Cycles for a fun ride on an ebike-allowed trail in BC. Definitely TOO critical here on this review. You do that a lot I’ve noticed with hub drives, and not so much for mid drives, and just way more picky on these than mid drives. Many mid drives have a lot of the flaws that you point out here, but you dont point them out on mid drive models. What gives ? Its like you give them a FREE PASS ! I dont buy your excuse at, that your nit pickiness is because its comparable to higher priced models and its at a low price. Ever heard of great VALUE !!! Of course its comparable to higher priced models, just Like ive pointed out to you time and again in the past about hub drives and to many of your readers. Your inconsistencies on these reviews is getting very blatant, and it has to make one wonder how much you are being paid by Bosch or some other mid drive OEM ??? Are they subsidizing you ??? Please reveal that, because if so, and you aren’t revealing it, its called fraudulent misrepresentation. And the comment about the throttle. Lets be real. Most mid drives dont have a throttle at all. I’m calling you out on this stuff, because you need to be called out on it, because you are **REALLY** being unfair in a lot of these hub drive reviews. 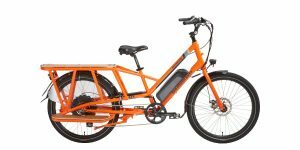 Hi Jim, the official Bafang website lists the details (the page has since gone down but was at http://www.bafang-e.com/en/components/component/motor/rm-g31250dc-1.html) for the RM G360.500.DC motor as 50 Nm and that’s why I deviated from the Surface 604 spec. I cannot say whether Surface 604 modified the motor to be higher torque or if it’s even the same exact motor. They provide me with that model number as well as the 65 Nm. To be honest, it’s a bit difficult to compare torque ratings because there may be differences between how a nub motor and mid drive are measured. I can say for sure that the Shred feels powerful and is very fast. My favorite part about the drive system is how natural and fluid the torque sensing bottom bracket feels. I hope this helps! 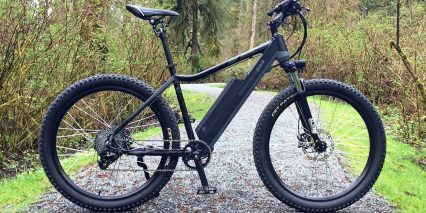 Justin from Grin Technology routinely program his ebike kits to produce way more power and torque than what is typically specified by the manufacturer. It’s more about how much volt and current is fed into the motor from the controller and how long the motor could endure before it overheats or before the plastic gears break. I had a long discussion with Justin about this. Fortunately, he has his motor simulator and he has vast first hand experience on the limits of the different motors. One specific motor that I discussed with him was actually programmed to have almost double the power and torque output compared to the manufacturer specification but he was still getting durable and reliable performance out from it. 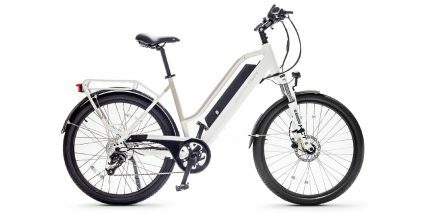 So in my educated opinion, yes, these motors can perform beyond the manufacturer specification, especially if the ebike company tested it themselves for longevity. You just need a controller with higher output. Thanks for the great review! 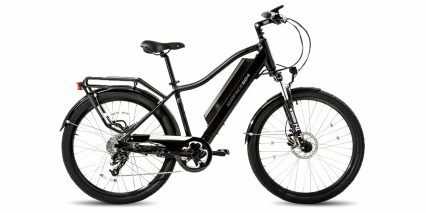 I just started looking for an e-bike that’s good for city, and decently equipped to tackle some trails (sounds like your normal usage in your review). I have a budget of around $2k. Would this be the bike to get in your opinion? I was also looking at the FLX Trail (not even sure why, I think it just popped up as something similar on your site/YouTube). How does this compare? 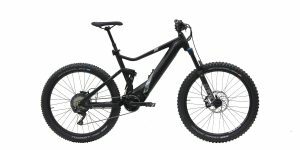 Are there other brands that have better options at this price range (Rad Power, etc)? 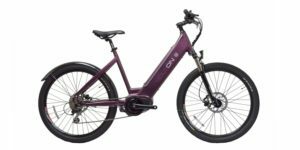 Actually, perhaps the better question, if you had $2k to spend for a city/trail bike… what would you get (if you had to make a choice). Sorry for all the questions, I know at the end of the day it’s a personal decision, but from the eyes of a newb… it’s really hard to tell the difference between these bikes even with all your great reviews! Thanks for the reply Court. 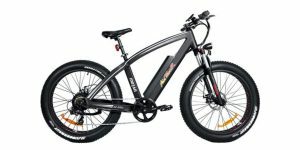 What other bikes would you consider buying in this price range and for this application? Hi Court, one more question for you. 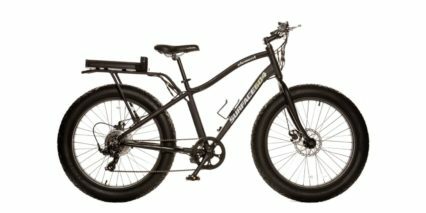 Any chance you know which version of the 27.5 x 2.8 CST Patrol tires this bike comes stock with? CST offers 2 versions, a wire bead single compound, and a foldable bead dual compound that includes their puncture safety layering (EPS). Just curious if I’m going to have to invest in some liners or perhaps a different set of tires if I end up getting it. Thanks! My Shred showed up today… Still waiting on the battery, but at least I can stare at the bike and dream. Wanted to post an answer to the question I asked about the tires, in case anyone else was wondering. The Shred comes with the foldable bead, dual compound, with CST’s EPS.